If you have a child with developmental disabilities and/or medical, social, emotional, and educational issues, you will, no doubt, be well acquainted with papers. Hundreds of them. Stashed and stacked in several locations with the one you need right now, nowhere to be found. With all of my upcoming appointments with state agencies and the other adult system programs, I realized it would be an asset to have ALL OF THE PAPERS PERTAINING TO ETHAN organized in some way that I could produce documents I need quickly. I did the things I do when I am mentally preparing to do something I don’t want to ~ I rebooted the laundry, emptied, scrubbed and sanitized the kitchen sink and pointed Pandora at Brandy Clark and Kacey Musgraves. Then, I gathered the ‘Ethan-related’ piles and made a mega-pile. It was daunting. I began making new, smaller, homogeneous piles like this. The number of categories kept growing – DDD, Performcare, Horizon, Camp Info, ARC, SSI, medical reports, school reports, and many more. I placed sticky notes in front of each pile because it got confusing. I won’t tell you how to file or store your documents. I truly believe that a filing system has to make sense to YOU – not someone else. You can find endless YouTube videos about how to establish a filing system. Pinterest is full of organizational eye candy. Remember, these are ideas and opinions. Just getting all of your paper in one place is a step in the right direction. Most of us are very challenged by the daily time crunch and if you have aspirations about a pretty or an extensively filed system, you can do that one step at a time. 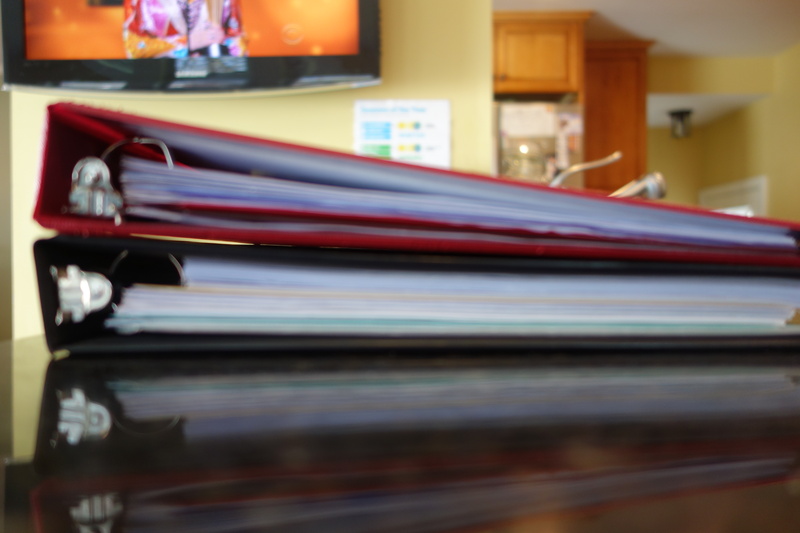 I put all current papers into two, three-ring binders with labeled tabs. I can easily transport the binders with me to appointments so that I have access to anything I might need. 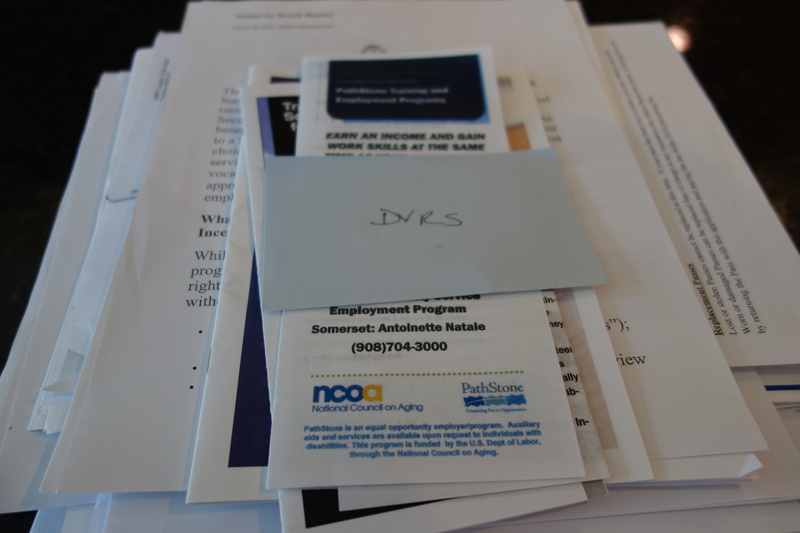 I made a couple of copies of papers that are bound to be asked for several times like our guardianship award letter, a copy of his medicaid card and initial SSI award document. I filed older documents and items I knew I definitely don’t need at my finger tips in a file box. I also found a lot of pamphlets, booklets, “How To” guides, and periodicals. I simply gathered them up and found one shelf to keep them all on. At least I will know when I am searching for something, it is all in one place. It’s a start – and sometimes that’s the hardest part.